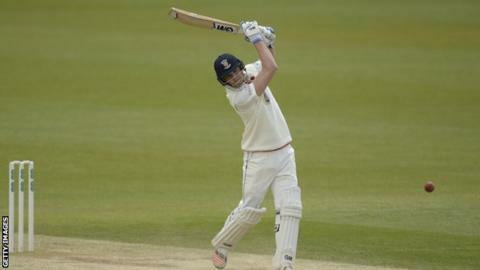 Jack Burnham hit his maiden first-class century as Durham made their highest score against Surrey at The Oval. The 19-year-old hit 18 fours and two sixes on his way to a career-best 135. Having shared a 145-run third-wicket stand with Scott Borthwick (77) and a 91-run fifth-wicket partnership with Michael Richardson (68), Burnham was caught in the deep off Tom Curran. Durham captain Paul Collingwood's unbeaten 75 saw the visitors reach 543-7 at the close, a slender lead of 86. After Borthwick was trapped in front by Gareth Batty, England all-rounder Ben Stokes only made 12 before falling caught-and-bowled to spinner Zafar Ansari. As the away side continued towards a huge total, Collingwood passed 15,000 first-class runs - hitting eight fours and a maximum in his 75 not out off 103 balls. Ryan Pringle's three sixes in an explosive 37 off 38 balls upped the run rate as Durham breezed past 500. Ansari was forced off the field late on after being hit while bowling on the same thumb that required surgery at the end of last season, having been dislocated in Surrey's Championship match against Lancashire. "The boys stuck in there well. It was quite tough out there today and as a bowling unit we had to be so disciplined. "There wasn't much there for us but our plan was to stick in there for as long as we could, make them play their shots and hopefully come out of top. "We were trying to make it as hard as possible for them to score. By and large we stuck to our plans well but there are a few areas where it slipped a bit and we could improve. "Tomorrow we'll look to come out strong, bowl them out and bat for the rest of the day to save the game."